Kate is a busy litiagtion lawyer as well as a single mother to fifteen-year-old Amelia. She is in an important meeting one morning when she recieves a phone call from Amelia's school. Amelia has been suspended from school and Kate must pick her up as soon as possible. Kate rushes to the school but is held up. By the time she arrives at the school, Amelia is dead, having jumped from the school roof. Kate is devastated. She'd always done her best to juggle her demanding job and caring for her daughter and now feels responsible for Amelia's death. She feels she should have known that Amelia was feeling so low she would choose to kill herself but in the coming weeks, Kate discovers she had little idea of what was going on in her daughter's life. 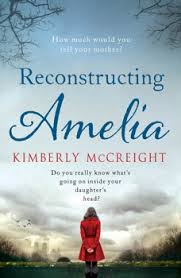 Reconstructing Amelia is told from both Kate and Amelia's point of view, switching between present day and the past, and includes text messages, emails and Facebook updates. It took a while for me to really get into the book. I was intrigued from the beginning but it wasn't until about a third of the way through that I became hooked and was desperate to find out what had happened to Amelia and why she ended up on the roof. I felt for Kate as she began to delve into Amelia's past and discovered a whole new side to her daughter's life that she never had a clue about. I admired her strength as she ploughed on, despite how difficult it must have been for her to uncover some upsetting facts.